And get a blacklight-inked "Erologo" t-shirt! The Cacahuatl Eater is witty, irreverent, iconoclastic, enlightening and always informative. He pokes fun at 'organophiles,' the medical establishment, drug laws, and at times even himself. 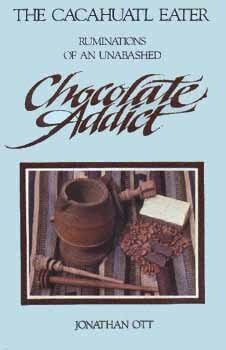 The Cacahuatl Eater is the only book to treat chocolate first and foremost as drug, and to suggest the chemical basis for the chocolate habit, a type of drug addiction. "Done in a very readable whimsical style that provides an entertaining approach. I find the discussion of the medical properties of cacao most useful. Overall the book is well done and I am very pleased to use it in my course on chocolate." The Cacahuatl Eater is Jonathan Ott, founder of a small chemical manufacturing concern. His books include Hallucinogenic Plants of North America, Teonanacatl: Hallucinogenic Mushrooms of North America, and the English translation of Albert Hofmann's memoirs, LSD: My Problem Child. He has published a number of scientific articles, and is wont to consume about a quarter pound of chocolate daily.